In the online class I’m teaching this month, the question of whether to send holiday cards and gifts to clients — and if so, when and how much — came up. If you’re self-employed, holiday cards for smaller clients and gifts for larger ones are a must. Besides, it’s a tax write-off ($25 per client, per year, last time I checked). 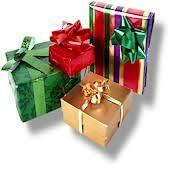 This New York Times article outlines many of the do’s and don’ts of giving holiday gifts to clients. I second the article’s suggestion to avoid sending your gifts at the height of the holiday season when key contacts might be on vacation until long after your carefully selected fruit basket has gone moldy. Since I’m always late getting my holiday cards and gifts out, I just send ‘em during the new year. Even better, I’ve been known to hand-deliver them to my local clients. Doing so gives me a chance to check in, and people seem to welcome the distraction (and then call me the next week or month with a project they need done). The NYT also advised thinking outside the gift box and getting something more unique than the tried-and-true (not to mention gross) fruitcake, something that ties in with your business model if you can. For example, I’ve been known to send newspaper and magazine editors books, journals, and stationery. However, I’ve also been known to make my own gift baskets filled with toys or bath products, which have little to do with writing but seem to be a big hit. Curiously, while client gifting in December is here to stay, the Christian Science Monitor reports that cash holiday bonuses for employees seem to be going the way of the dodo. Well, at least those luckless employees can swill on all that wine, cheese, and chocolate their vendors and freelancers send them by the truckload every holiday season. I usually just get some rumpled, coffee-stained cards in the mail. * My dog can’t even eat those. *In all fairness, I did get invited to several client holiday parties this year, which made me feel ultra-loved. Thank you, warm and fuzzy clients. I’ve only been on the client-side of this issue. Best/unique gift: stainless steel bar set. Worst: about a 6inch by 8 inch square of solid milk chocolate with the vendor’s logo imprinted in it. This entry just made me think of David Letterman giving out canned hams to his audience, and I think its Conan who occassionally passes out Preparation H.
ha! do you think my clients would go for handy wipes or valium or something else out of the medicine cabinet? maybe some wart remover? or pepto bismol? or laxatives? yeah, that would be swell.